You can drive from Nelson to Vancouver in one day if you put your mind to it, but we are pokey so we budgeted two days. 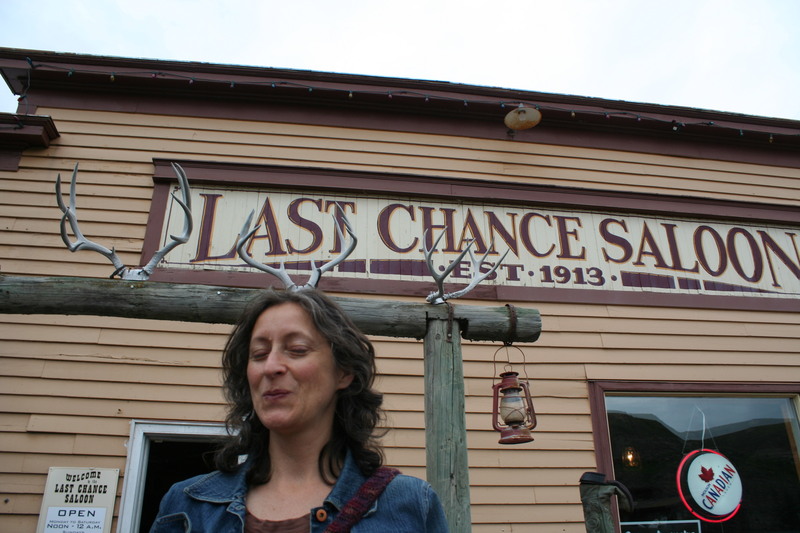 We tried to visit some friends of Linda’s in Slocan, which is a significant detour, but when we finally got to their remote mountain compound, no one was home. They have a large yard in front of their forest house where they have a music festival every summer, and generate their own electricity with a water wheel in their creek. We had to backtrack down to the highway. The road was not a busy one, but it still had an organic coffee wagon on its side, so we stopped for some espressos. Back on the Crowsnest Highway (otherwise known as Highway 3) we picked up a hitchhiker who stayed with us until Grand Forks. 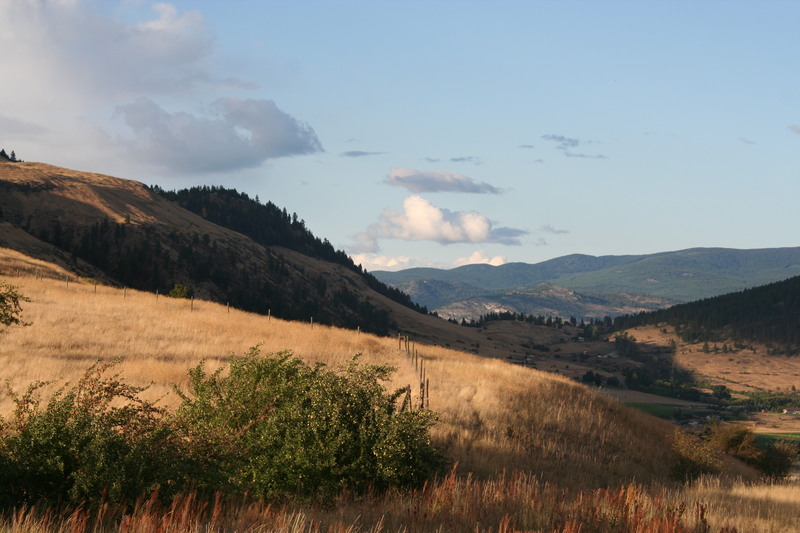 Especially in August, the East Kootenays are really arid. 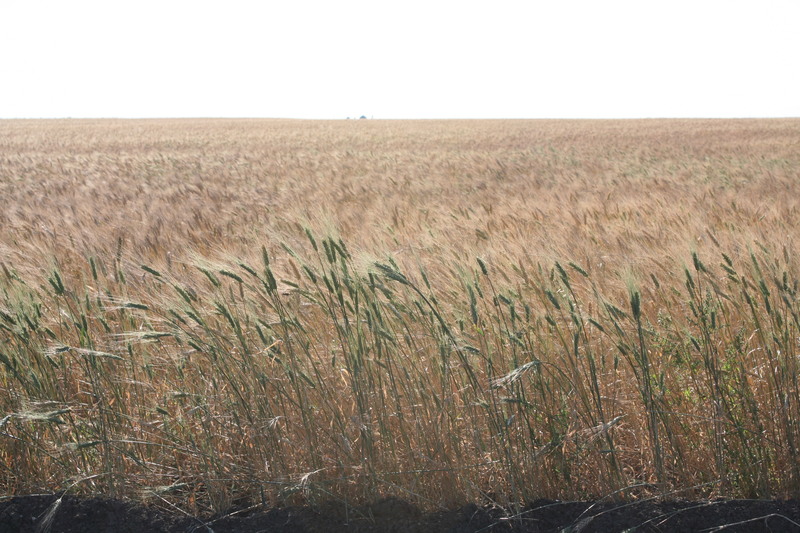 A lot of Ukrainians settled in the area, and that combined with the dry grass gives the area a prairiesque feel. Or maybe that’s just me; for some reason I associate Ukrainians with wheat products like perogies and bread. We really weren’t in a hurry, so we decided to set up camp early for us, and stopped at Boundary Provincial Park near Greenwood. It’s a smallish campsite that really has not much to recommend it other than it’s a decent place to stop overnight on your way to somewhere else. I took my Edible Berries of the Northwest book, which I had purchased at the Junction of Alaska Highway, to see if I could identify any of the surrounding berry bushes (no) and took a walk around the small campsite. 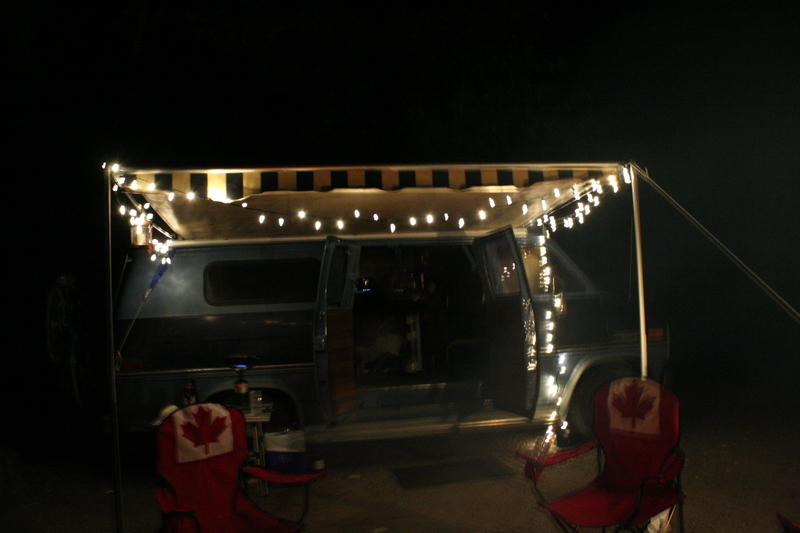 There I saw a most amazing camping setup! 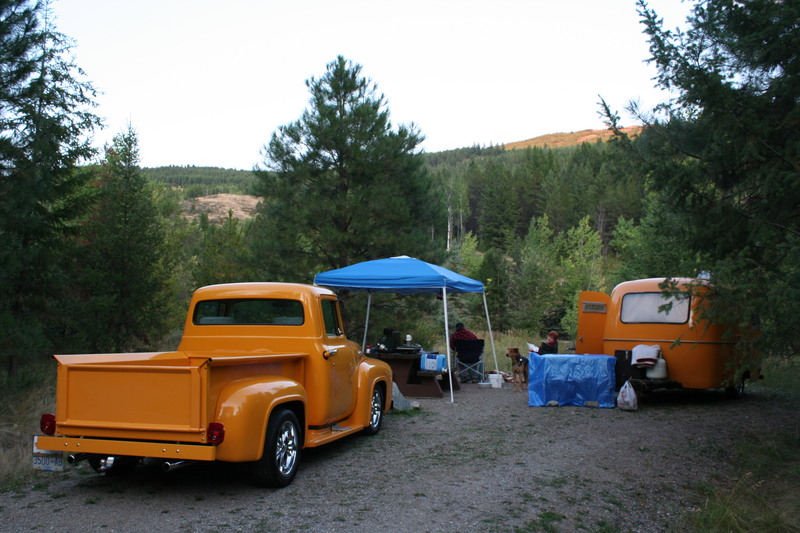 Some people had a perfectly refurbished old Ford truck, and a perfectly refurbished Boler camper trailer, both painted in shiny canary yellow. I asked them if I could take a picture so I could share it with you. That’s road trip living! Night fell and we were cooking away when suddenly the marine battery that powers the amenities in the back of the Boogie Bus failed. Against Step’s advice, I tried powering with the power pack. Electrical fire! Fortunately with a quick disconnect the fire wasn’t able to gain any traction and we didn’t have to use our little extinguisher; it fizzled out on its own leaving just the acrid scent of electrical damage. We were perturbed and confused by this, as we had just put in a new battery at Portage la Prairie, and had not had any trouble the whole time we were on the road. I suppose if this must happen, the last night of your trip is a good time. (A few weeks later we took the Bus to the camper van hospital, where they were able to determine the cause as some faulty wiring, which of course we had fixed and have not had similar troubles since.) We were still able to stay up as we had the LED lights directly powered by the power pack, as well as lantern and firelight. The next morning, as a special last-morning-on-the-road treat, I fried bacon and the frozen toutons we had purchased in Labrador City. MMMMmmmmm, breakfast that can kill you. 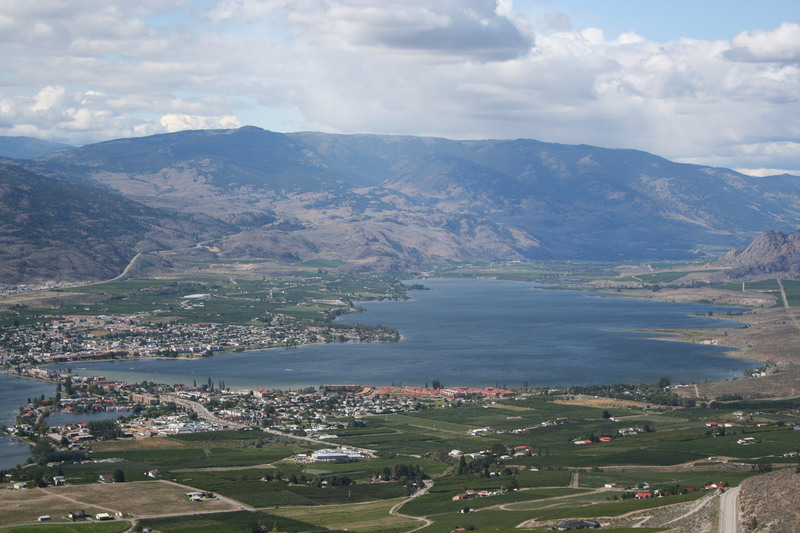 The Kootenays are quite hilly and you are on a high mountain side before you enter the Okanagan region at Lake Osoyoos, so you get an incredible view of this northern dessert. 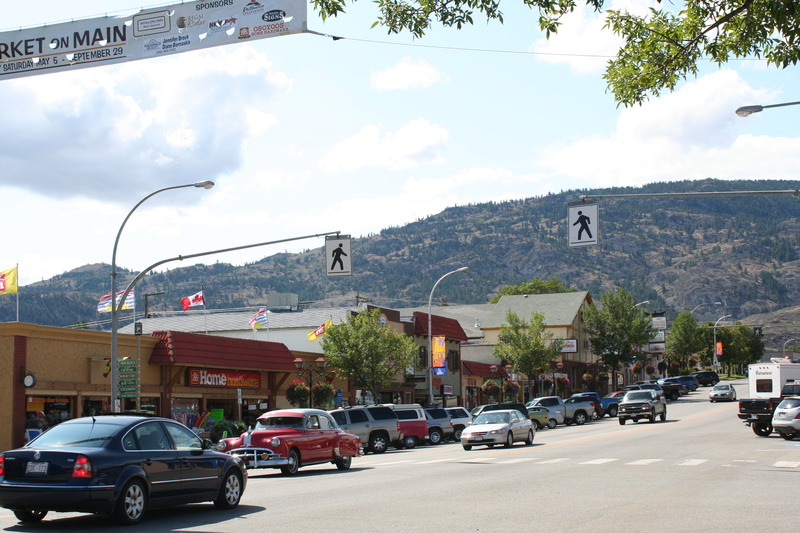 Even though Osoyoos is kind of redneck, I really like the hot, dry air of the place, as well as the shallow warm lake, and traveling through was a good reminder I would like to spend more time in the area. I have fond memories of visiting there with my family in my youth. There are a lot of vineyards and orchards, and it’s a true dessert so it has cactus and rattlesnakes. Most people do not associate Canada with such things, but I assure you they are there. 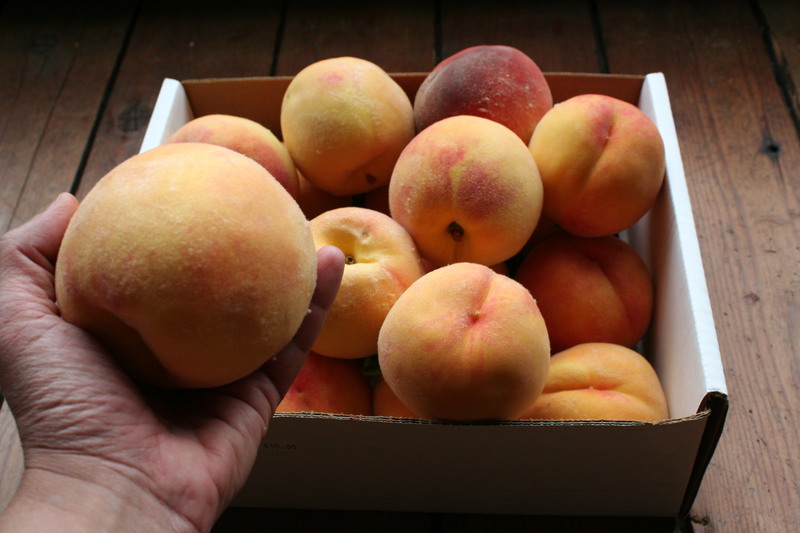 The fruits of the Okanagan are famous, and you will never find a sweeter, riper, juicier peach than you can there. All along the highway you come across fruitstands and U-picks. 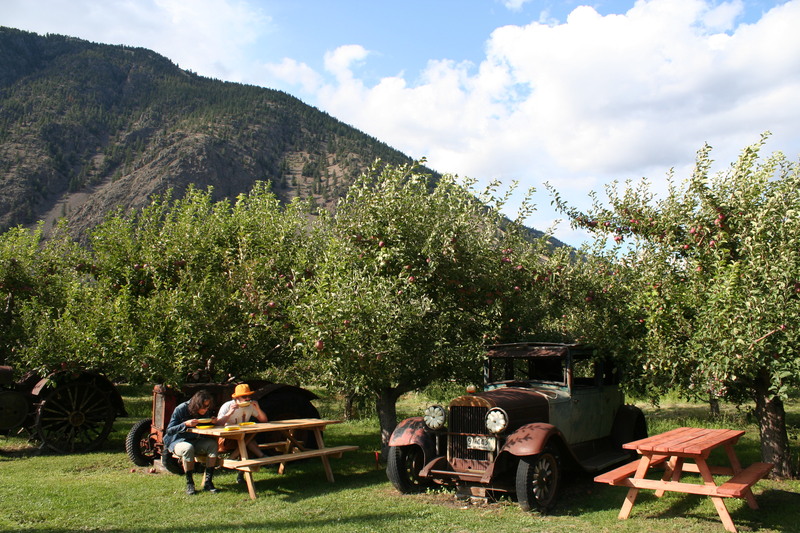 We went to an organic fruit stand in Keremeos, but the fruit didn’t look amazing and there wasn’t much there, so we backtracked a bit to Parsons Fruit Stand. Parsons isn’t certified but they grow everything organically. I bought a large box of peaches, some cherries, pears, plums, peppers and garlics, and we all had some of their sweet and buttery corn on the cob which we ate at pleasant orchard side tables. 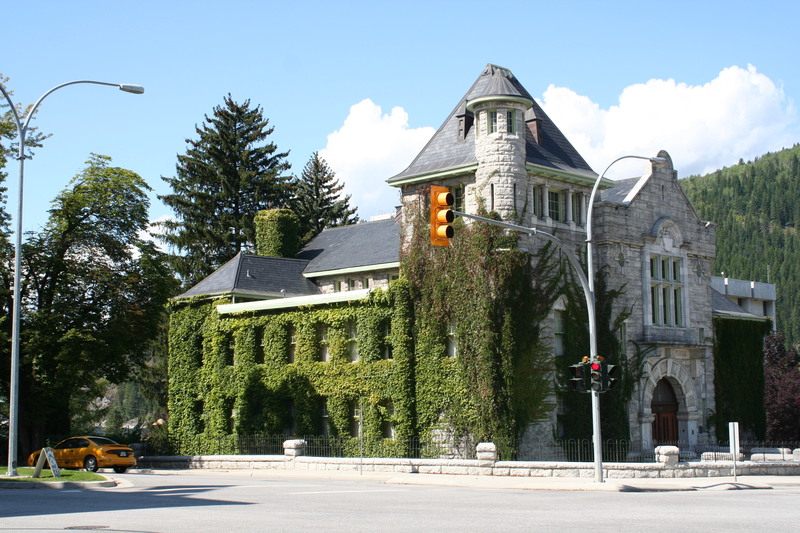 Then we had to drive through the Princeton area which is my least favourite part of the Crowsnest, because it has a lot of really steep inclines and difficult switchbacks, and somehow the trees are boring instead of majestic. We stopped at a particularly depressing rest area and ate smoked trout inside the bus, and in Princeton itself there was a bit of driving around looking for propane (we saw lots of tanks, but none was for sale to us) until we found the Husky on the edge of town. By the time you are there, it’s just a hop, skip and a jump to Manning Park. Manning Park has the makings of a very nice drive through, unless it is damp and you are only hours away from the end of a summer trip that you wish wouldn’t. Also, we could really see vividly the devastating effects the Mountain Pine Beetle had had on BC forests, with the dead, red pines peppering the mountainsides. Linda, the most eco-conscious of the 3 of us, made the cup half-full comment that after all the pines are dead, the beetles will perhaps die off and the pines could grow back. (Personally, that can’t happen soon enough for me. I need White Pine needles to make medications if the apocalypse comes, but that is another blog altogether). After Manning Park you get to Hope, where the Crowsnest Highway merges with Highway 1, and that is so in the neighbourhood of where we live I started to get really depressed. Then Harrison Hot Springs. I was driving and I kept driving slower and slower because I didn’t want the Cross Canada Boogie Bus Adventure of 2008 to ever end! It was dark when we got to Chilliwack, but since I grew up there, I know my way around quite well and I took the long way ’round to the propane fill-up. Even though it was past 10pm, I was grateful for the heavy traffic on Highway 1, as we got closer and closer to Vancouver, but the inevitable would happen (hence the descriptor “inevitable”) and we were inside city limits, and we spent one last night in the Boogie Bus on the street in front of Linda’s before finally moving out of the van and back into our loft in the hipster hub of Mount Pleasant. I’d say there’s no place like home, but despite how far we had traveled, when you have a funky machine-for-living-on-wheels like the Boogie Bus it’s like you’re just taking your home for a jaunt around your backyard. 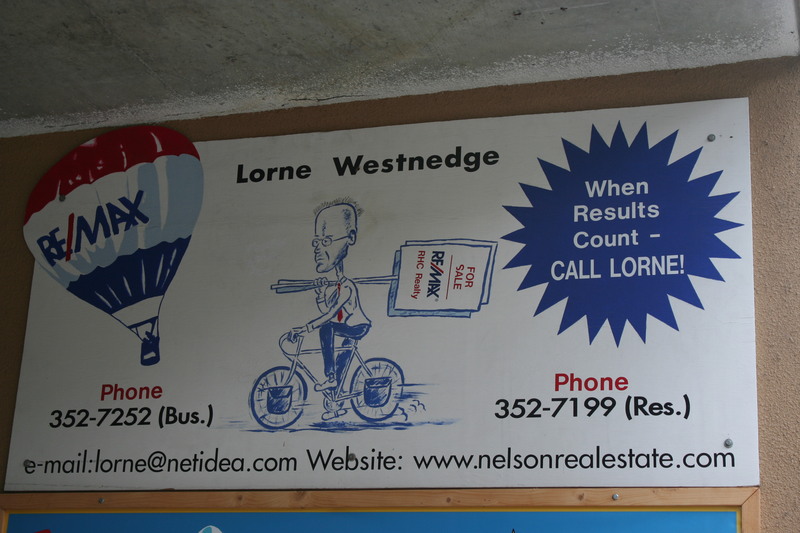 I am embarrassed to admit it had been 18 years since my last visit to Nelson (but even then I couldn’t believe how granola the place was). In 1990, Nelson had maybe 2 square blocks of shops and one night club called the Boilermaker. Nelson 1990 was the first place I ever saw a bookstore that was also a coffee shop. Nelson 2008 still felt like the-Nelson-I-Remember, except a lot more developed. It still has a lot of dreadlocked, patchouli drenched girls and boys wandering around in bare feet, but there are people in business suits, too. 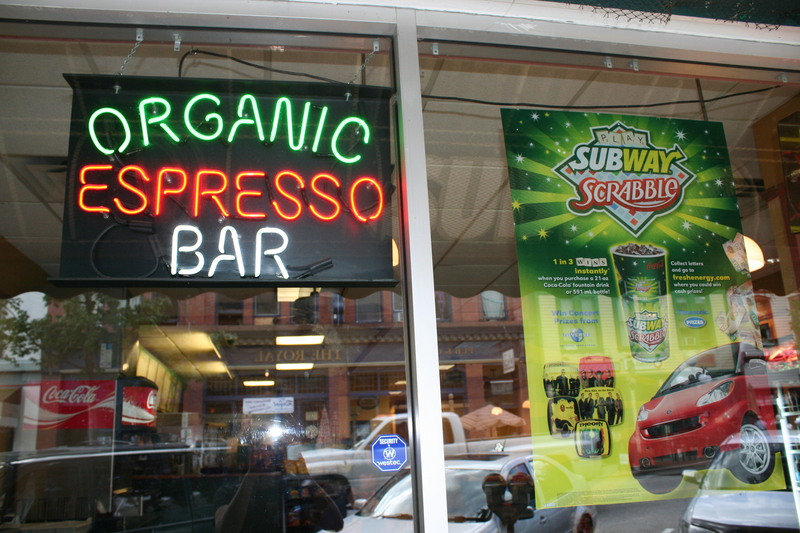 You can tell it’s kind of a lefty town because even the Subway sandwich shop serves organic espresso. Most people in Nelson shop for food at the Kootenay Co-op, and we were able to get everything we could want there—kefir, yoghurt, Ebesse Zozo, which is the world’s hottest and most delicious sauce. 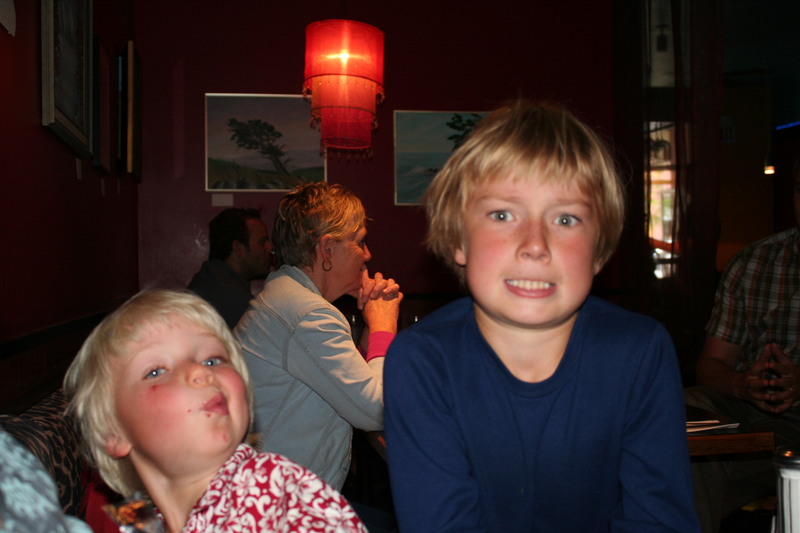 We bought a bottle of medium spiciness, but when we sampled it later it was almost unbearably hot. I mean, one drop was too much. An insider told us there had been a TV segment done on Ebesse Zozo recently, and they had demonstrated how to make old school Grandma’s full strength hot sauce, then bottled it while filming. They only had medium labels so they put those on the super strength batch, then set them aside. Is it possible that this special batch had somehow made it on the shelf of the co-op, labelled “medium”? 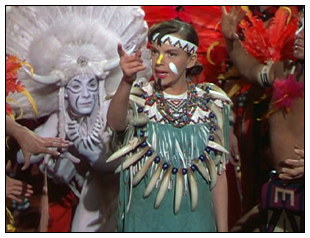 (In the future, medium Ebesse Zozo would never be nearly this hot to us). 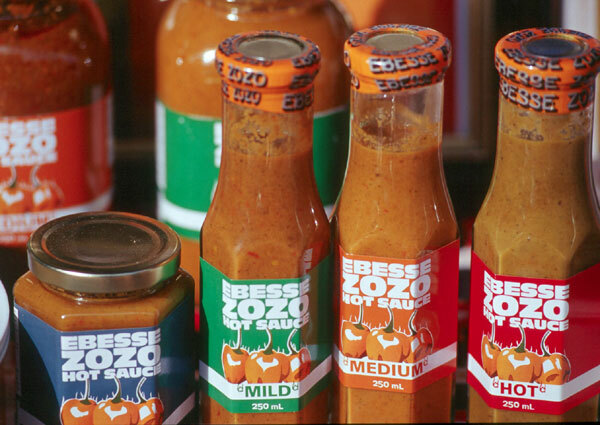 Rather than lament, we just trained our palates to enjoy hotter sauce, and I am am happy to say Ebesse Zozo is now available in Vancouver, and be it medium or hot we enjoy it on meals to this day. Jennie, who we had seen in Montreal earlier on our Cross Canada Adventure, lives in Nelson with her husband Erik and her two boys, Quinn and Felix (I love the name Felix. Is it trivial to have a child myself just so I can name it Felix? Only, if it was a girl, I would have to name her Felixia, which sounds really close to Felicia. On second thought, maybe I will just stay personally childless and enjoy Felix when I see him). I tried about a kazillion times to take a picture of Quinn but he made a face every time, except the time I snuck up on him at the co-op. I like to flatter myself I am mostly good with kids, but Quinn and I had an unusually strained relationship, even though I tried every way I could think of to charm him (and I did once or twice get an involuntary smile). I am grateful, though, that that did not stop him from teaching Step and I how to play Killer Bunnies. The game was suitable for players a few years older than him, and he wouldn’t let us look at the rules ourselves, so the version we played was somewhat garbled. But we still had such a good time playing it and he was such a huge fan we that the next day we went to Secret Garden Toys and bought our own copy. 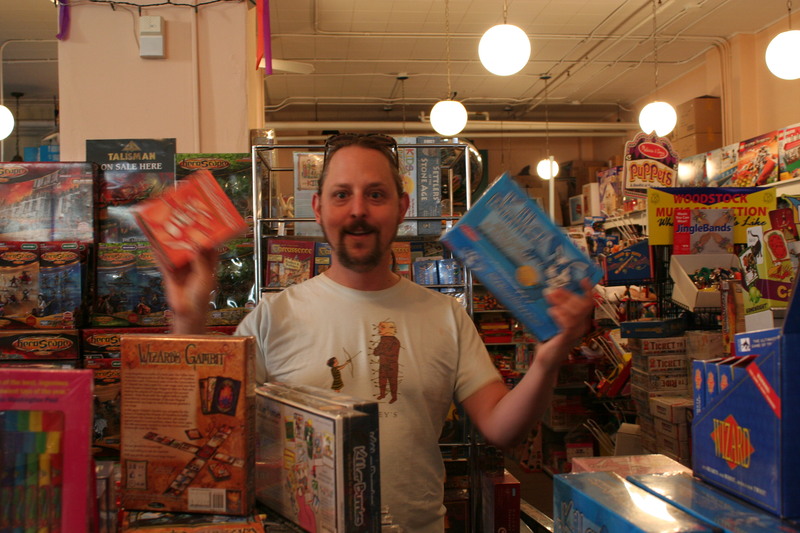 We were partly motivated just by a burning desire to actually look up some of the rules, but it is a purchase we have never regretted and have played the game many, many times since then, and have bought several expansions and introduced it to dozens of people. The clerk at Secret Garden Toys told us Killer Bunnies was a mad craze among the young folks of Nelson, and indeed, Quinn talked about it a lot. We also one evening played Pit with the whole Jennie family, but Felix insisted on playing by himself, (as opposed to on a special adult/youngster team), and as he was reluctant to trade any cards it was almost impossible for anyone to corner the market on anything, so we had to content ourselves with enjoying the free-for-all-ofness of it rather than any glow of winning a hand. 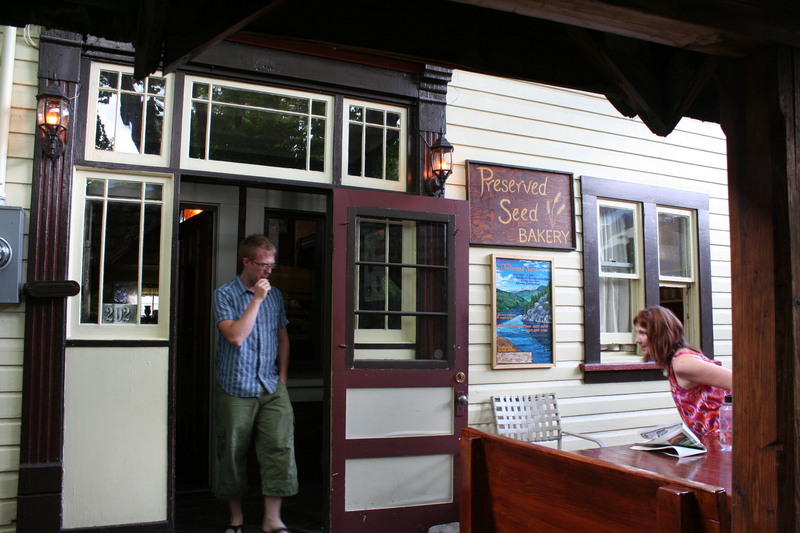 We visited quite a lot of funky cafes in Nelson; one notable one is called the Preserved Seed and it is run by a sort of—it’s not really a commune—it’s more of a spiritual community that has a couple of farms and an agenda of healthy, vegetarian food, agriculture and cooperation. We didn’t actually know any of this on our visit, but have since visited their satellite cafe in Chilliwack and have learned more about them. 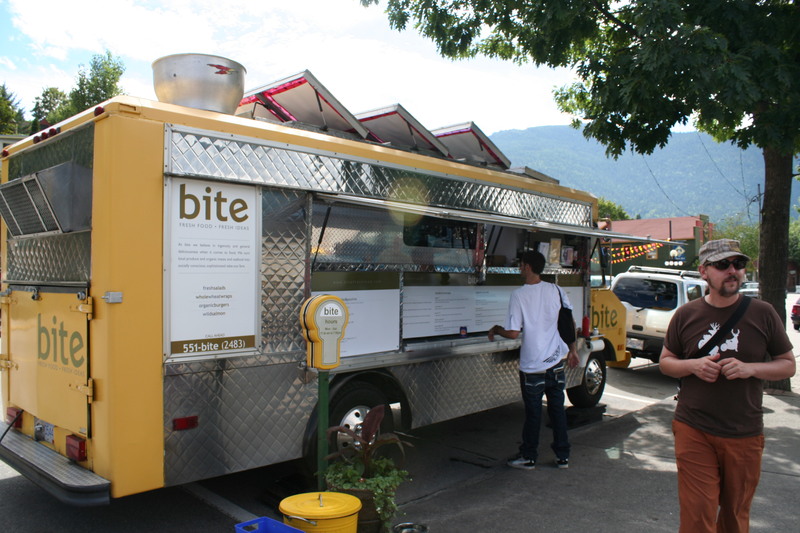 Nelson also has impressive street side food vendors (unlike Vancouver, where at the time you could only buy a hotdog from a street cart). 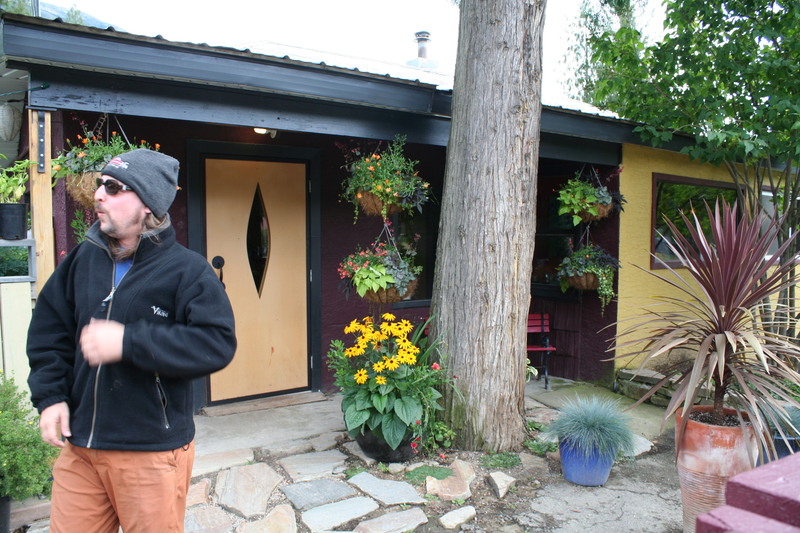 Say what you want about hippie people, they have really good food. Jennie, not a hippie, but still a food appreciator, made us a hotdog dinner with amazing homemade ice cream in which she used coconut milk instead of dairy, but we did eat one restaurant meal at the Redfish Grill downtown, at we were served large portions of delicious fresh food. The people of Nelson are keepin’ it real, as illustrated by a story Jennie told us about local CBC radio journalist (right-leaning) Bob Keating, who became so incensed when local (left leaning) health care activist Earl Hamilton called him a “government toady who was not to be trusted”, that Keating sent Hamilton a box of chocolates which he had rubbed with raw chicken. Keating almost immediately realised the gravity of what he had done, confessed to his wife, and contacted Hamilton and told him not to eat the chocolates. 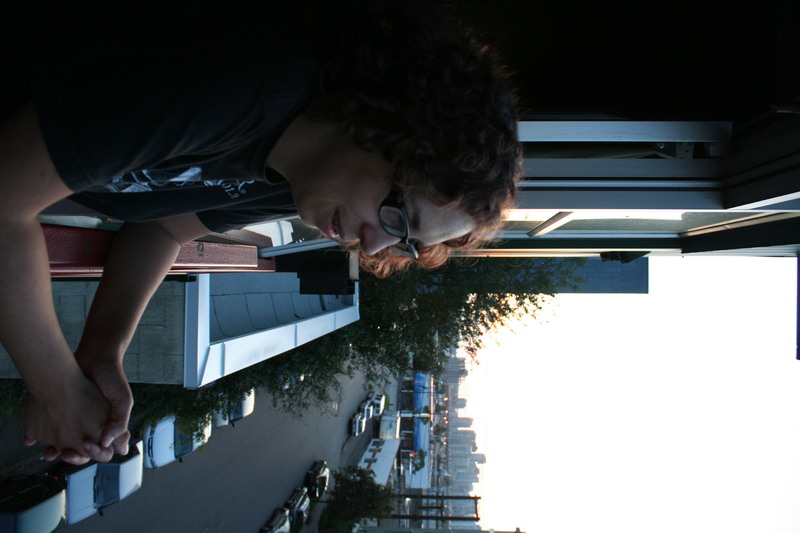 He then sought psychiatric counselling, and was fired from the beloved CBC. 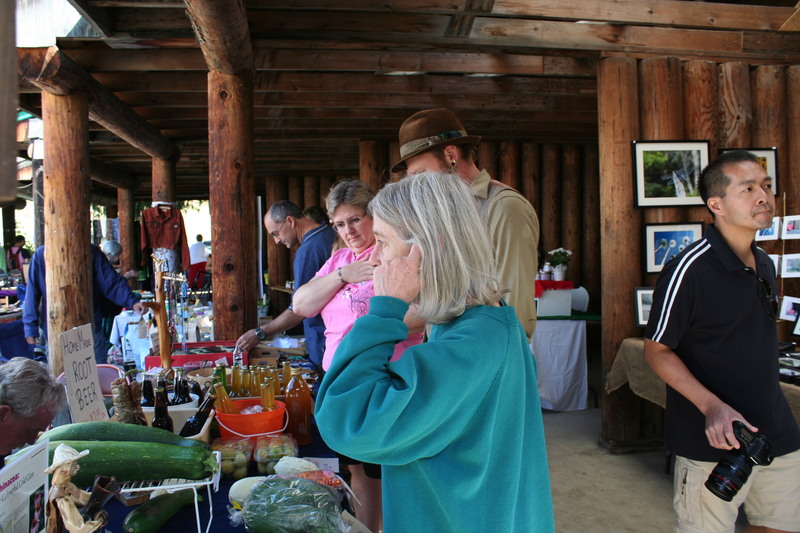 We were lucky to be in Nelson on Saturday, since that is the day of the Nelson Farmers’ Market . 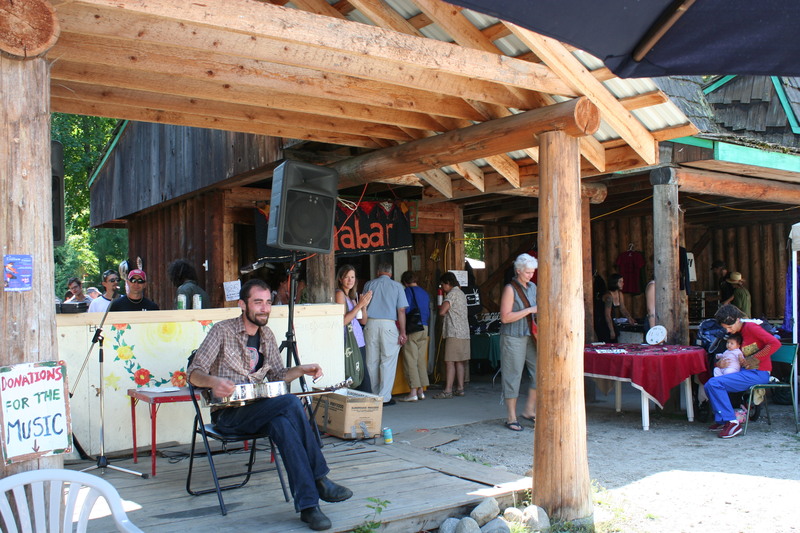 As well as the produce and food vendors, the market has live entertainment and really good root beer. I tried to buy a t-shirt that said “Stop Wars” in the style of the Star Wars logo, but none of them fit, so I paid the vendor for the shirt and gave her my home address where she could send it next time she printed some. She did send it, but the printing was really off centre so I sent this back (how could the printing be so off centre, you ask? I can’t say, but it was in Nelson, nudge nudge, wink wink). Later, the t-shirt order bogged down and I never actually got another shirt. You win some, you lose some. Near where the Farmers’ Market is, (Fashion Island on Hardy Street), is the picturesque Cottonwood Herbal Demonstration Garden, which is organically planted with indigenous medically and culinarily useful plants that attract beneficial insects like butterflies and ladybugs. 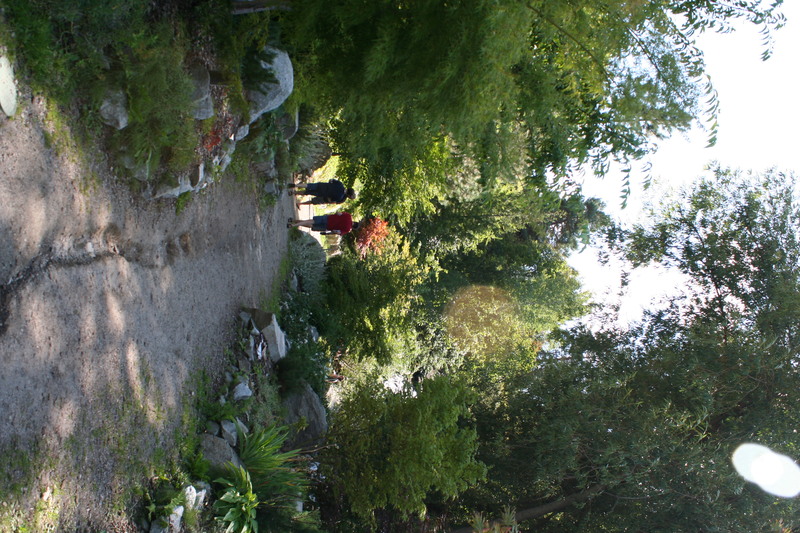 It has pleasant paths and a creek, and is a nice, meditative place to go for peaceful beauty. We had a little root beer and lunch with the Jennie family, and Felix cried when I hugged him goodbye (tears of horror, not sadness, I’m sorry to say), and then we were on the road again. 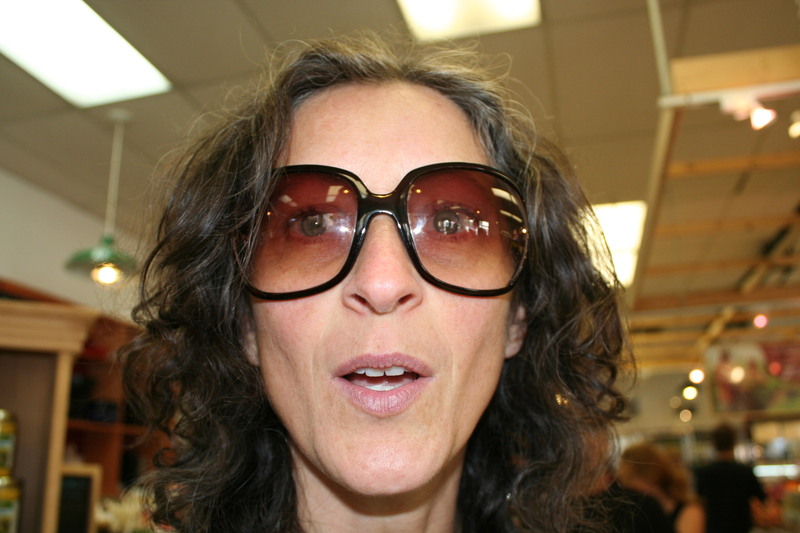 Linda Looks Like Cher in This Photo! 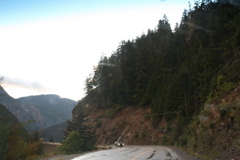 Next we drove through the Crows Nest Pass, and it instantly looked like BC, with misty mountains and really big trees. I felt like we were home already, even though we live on the other side of the province. 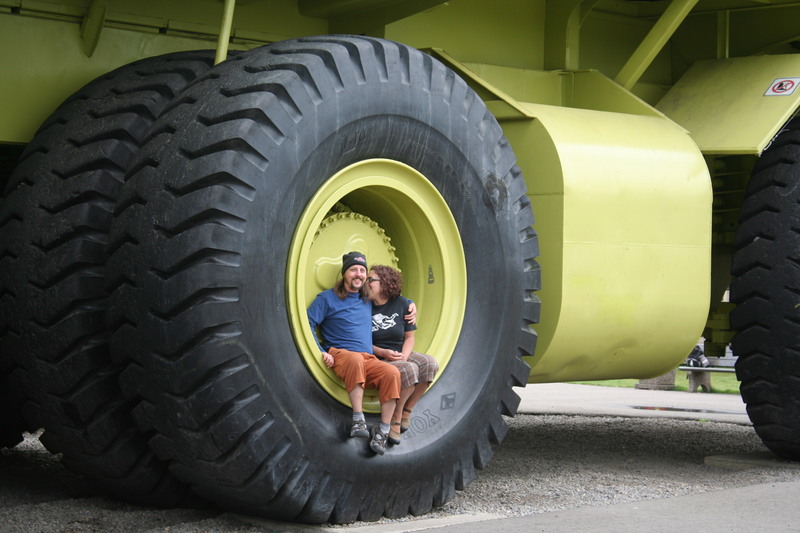 In Sparwood we saw a truck that was way bigger than the one we saw in Fermont, which I wouldn’t have believed possible if I didn’t see it with my own eyes. 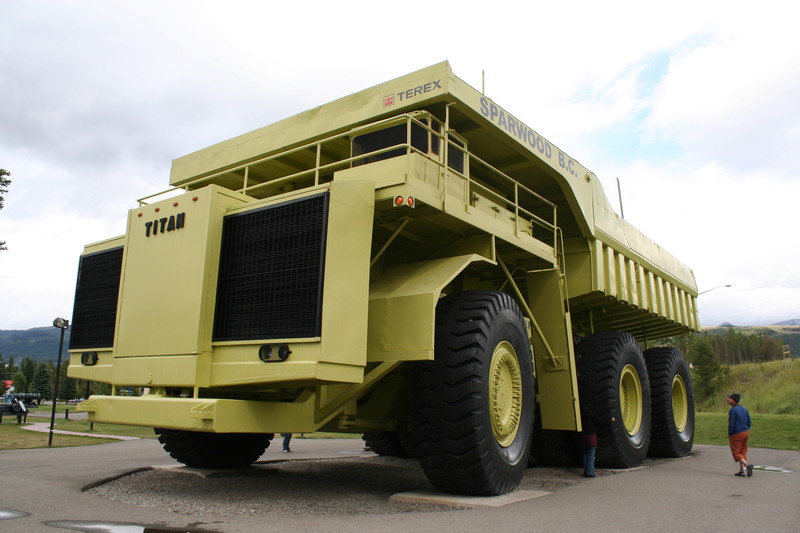 The Titan 39-19 is the size of a small apartment block, and can hold 2,000,000 golf balls! I don’t think that’s what it was built for, though, but they do advertise that detail on the plaque in front of it. 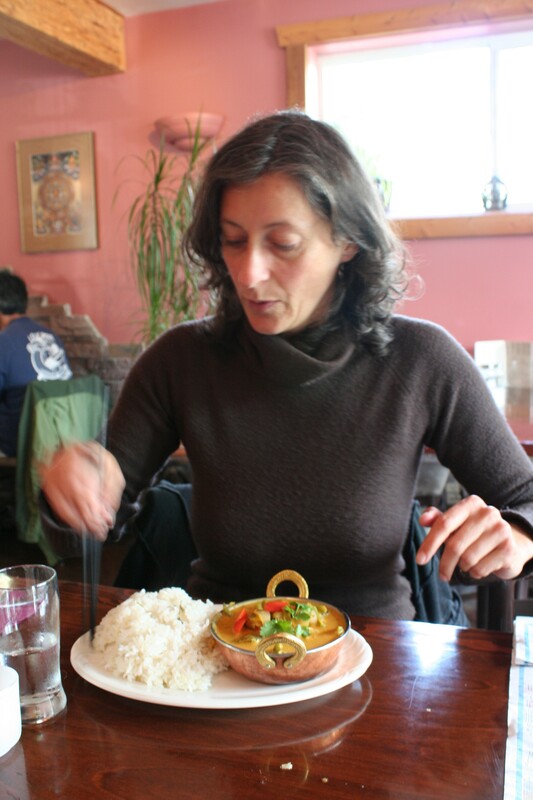 We were excited to reach Fernie because we anticipated delicious Hippie Food and went straight to the Good Earth health food store for a restaurant recommendation. We were floored when the clerk condescendingly suggested we buy our own food and cook it ourselves! Hello, we are enroute and living in a camper van—it takes us 3 hours to make lunch! So we thought that was rude. Other vendors in Fernie turned out to be much nicer, though, and the girls at Fresh, where we stopped for coffee, suggested we try Curry Bowl and that worked out well for us, with some nice fresh vegetables on rice. 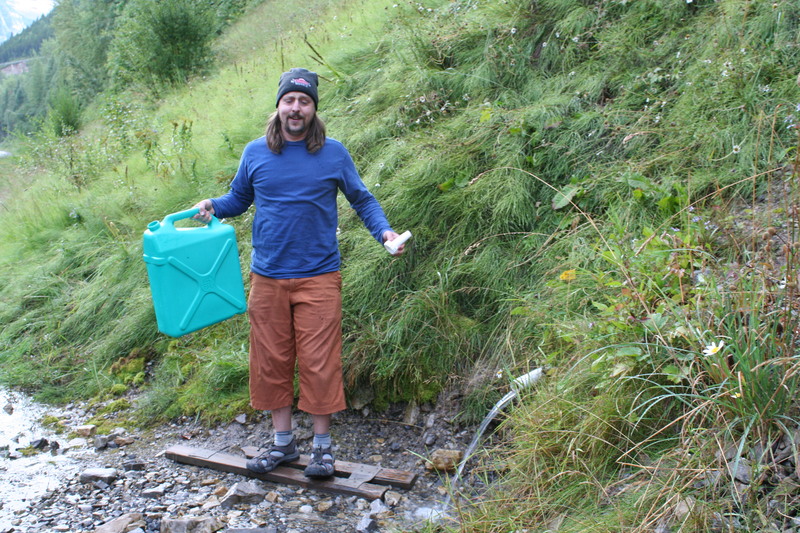 Also, when we asked the fellow at the gas station if we could fill our water tank, he told us how to get to the spring all the locals use to get water, so we were able to get real mountain spring water for free. I heart BC! We planned to camp in the yard of our friend Mo, who owned an A-Frame near Kootenay Lake, and we got there after dark (Mo wasn’t there at the time). Her place is kind of on the side of a small mountain and there’s a really rough dirt drive going to it that has multiple switchbacks and it must have rained recently because parts of it were muddy and the mud was really slidey. The Boogie Bus isn’t a 4 wheel drive or anything, and we got stuck maybe 2/3 of the way up. We couldn’t go any further so the only direction to go was back down, and we couldn’t even turn around so we had to do it in reverse. It was a treacherous situation! Linda and I were outside guiding Step to not fall off the road and I was making a lot of noise to ward off any nocturnal bears. My heart was in my throat and I was unreasonably cursing Mo’s generousity under my breath the whole time. By the time we finally made it back to the road no bear attack had occurred, but the Boogie Bus had lost a couple running lights, the bike strap was broken, and my adrenals were exhausted. We ended up going to a small provincial campground nearby, Lockhart Creek in Boswell, and it was busy so we were lucky to get a site. We had a few drinks and were disturbed by all the ATVs that kept roaring by in the dark. (When we awoke the next morning, we discovered our site was right next to the highway and the “ATVs” were actually ordinary traffic going by. It just goes to show how disorientating stress can be). It was almost September so the night was chilly and my toes were cold. 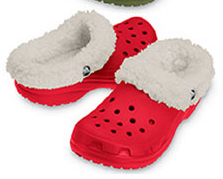 Suddenly, I remembered the fleece lined Crocs I had purchased in Quebec City. I put them on and they were like little fur coats for my feet—very nice! 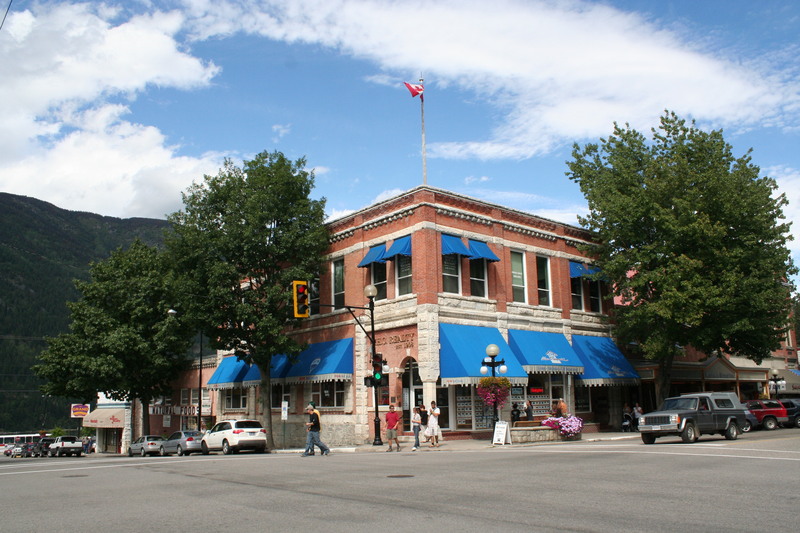 Boswell is on Kootenay Lake, which is a long narrow lake with small communities on it. It has a provincial ferry that goes back and forth all day, connecting the highway, and it’s free! Before we got onto the ferry we stopped for lunch at a place Linda likes, the Black Salt Cafe. Lunch was Hippilicious, just like we always wanted, and they did all the shopping and cooking for us so we didn’t have to. 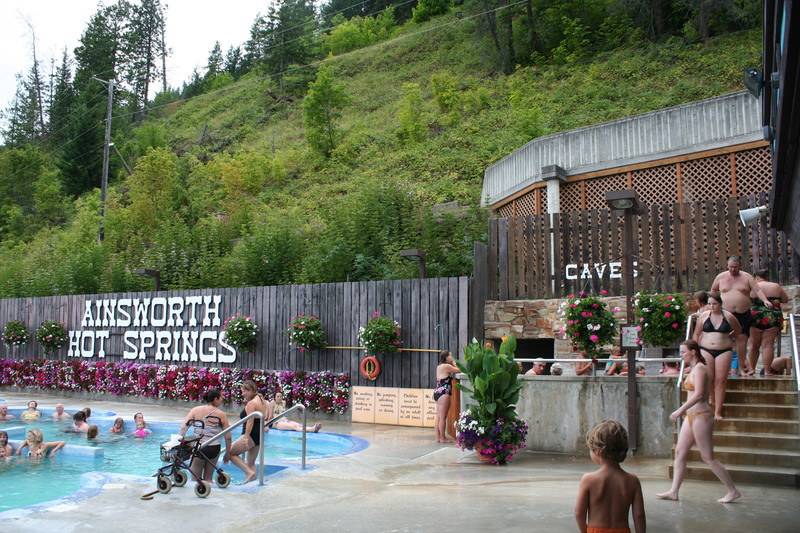 Instead of heading straight for Nelson when we got off the ferry, we made a short northern detour to Ainsworth Hot Springs. 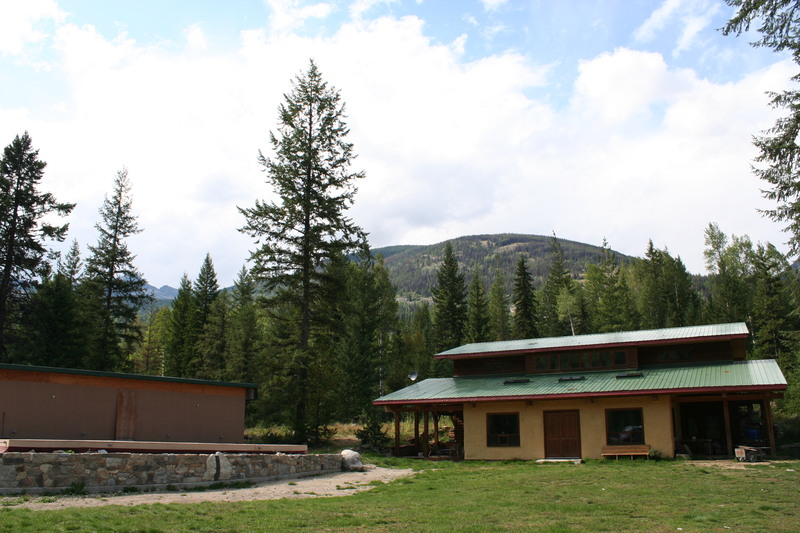 Having never been there before, I was imagining the hotsprings to be more like Liard Hot Springs, or Meager Creek (not featured on this blog), but Ainsworth was completely built up with a concrete pool. It was pretty all right, as far as crowded, commercial hot springs go. The worst thing about it was you weren’t allowed to wear any crocs or flip flops into the pool. I have a medical reason that this hurts my feet (actually, when I explained that to them, they allowed me to use my crocs, so points to Ainsworth Hot Springs) and Linda is afeared of foot fungus (not a good enough reason to be allowed flip flops according to AHS). 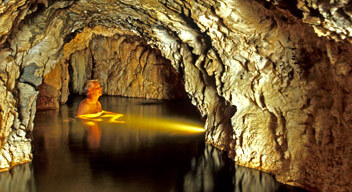 The best thing was a crazy, artificial underground grotto that is off one side of the pool. The other best thing was on the list of posted rules was moaning or chanting are not permitted in the cave. WTF? Only in the Kootenays. Ainsworth Hot Springs was fun! But like I said, really crowded. One shower and hitchhiker later, it was still fairly early in the day when we made it into Nelson, the most Hippie town in BC, and maybe even the world. 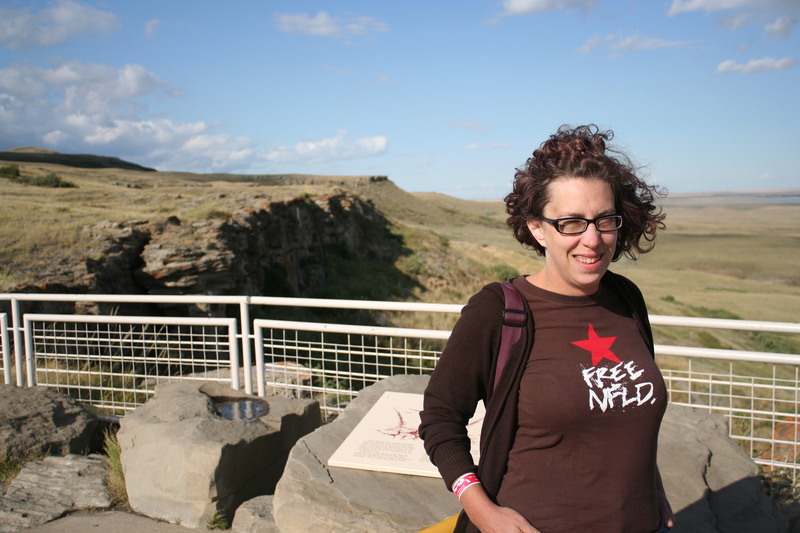 There’s no actual direct route from Calgary to Drumheller, but prairie lands were fresh for Linda, so we kind of drove down back roads for a while. It’s flat. 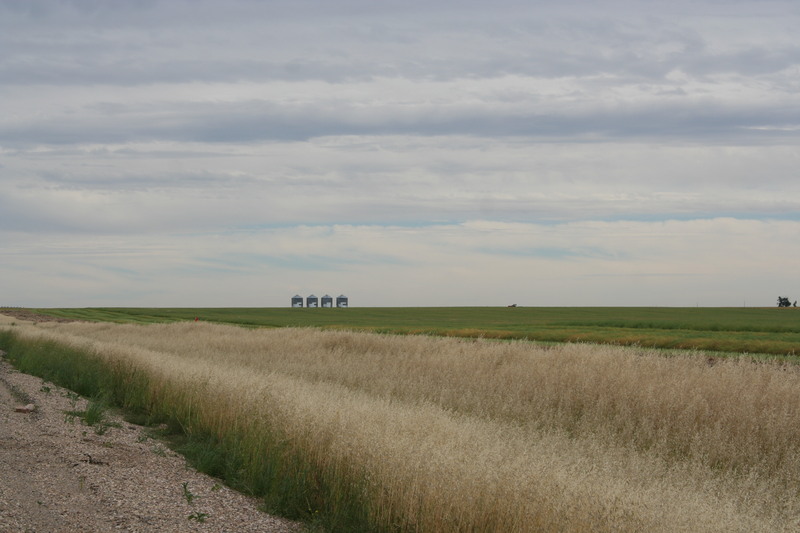 We saw a row of grain silos far in the distance, but when we approached them, we found they were nearby! And really small; it was all an optical illusion. We had quite the laugh over that. 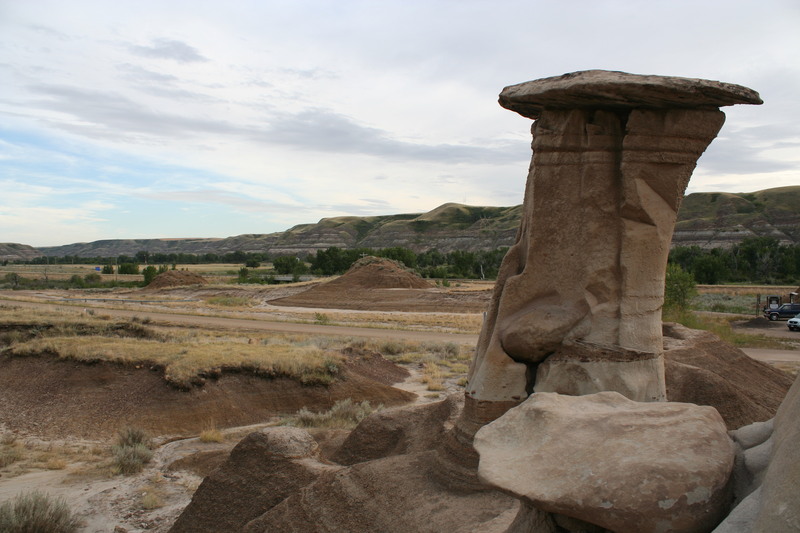 (I mention this as a literary device called foreshadowing, the relevance I think, will come clear when we get to the hoodoos). 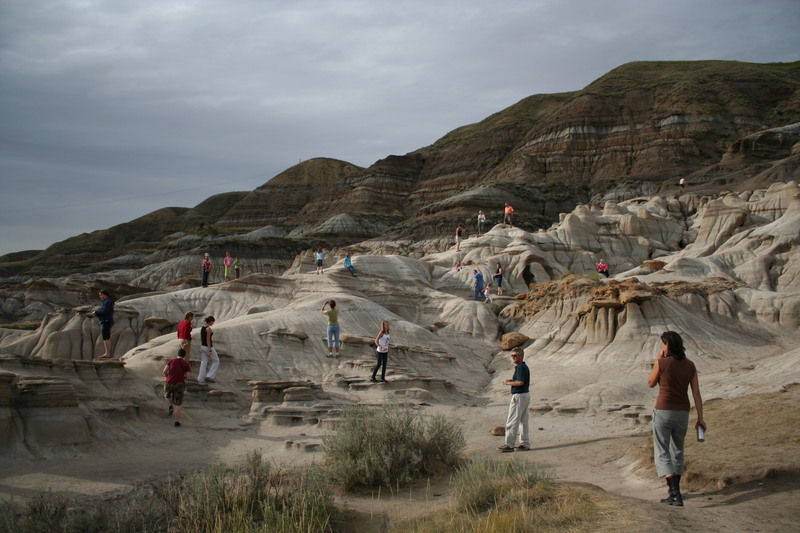 The Alberta Badlands, where soft earth deposits have eroded away and you can actually see the geological bands of the ages, look like the terrain where the coyote and roadrunner play. It was like we had been picked up and thrown into the Wild West. It was incredibly beautiful and I can’t believe I had been ignorant that such a place existed in the province right next door to where we live. 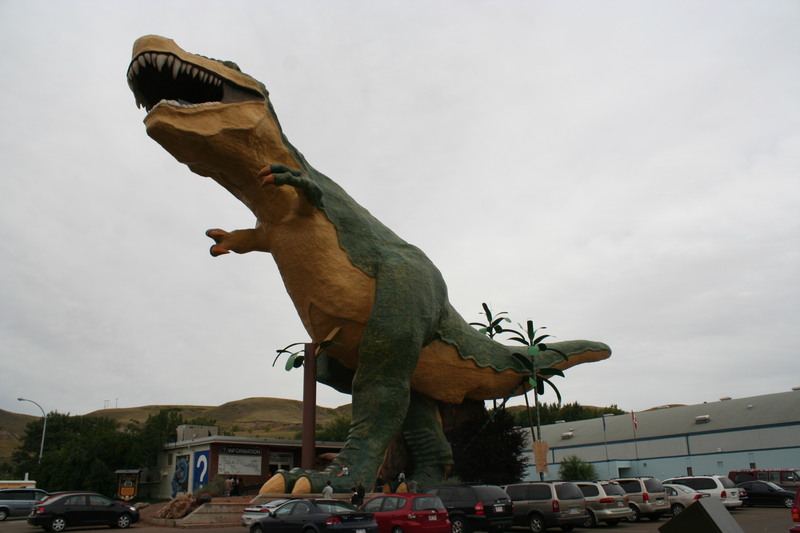 Drumheller is famous for having the most dinosaur fossils of anywhere, so Drumheller is all about dinosaurs. It’s a sweet town but too touristy for us. 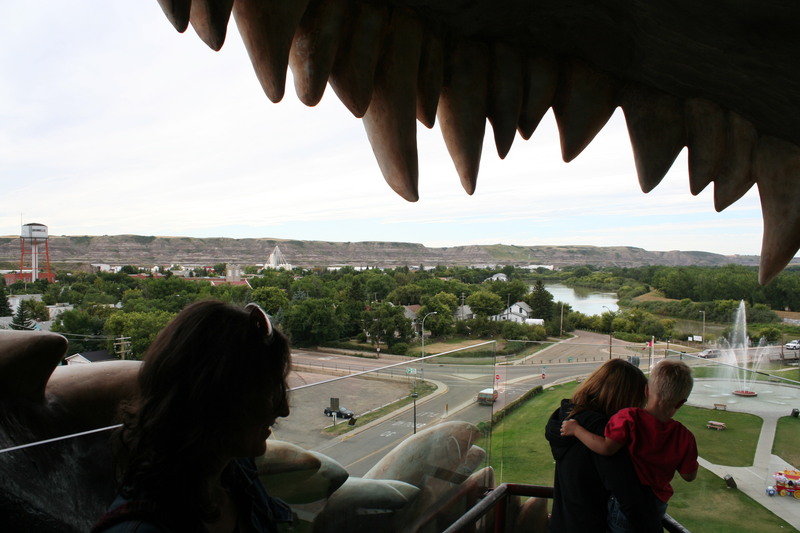 We didn’t go to the dinosaur museum, although we did climb up the gigantic fibreglass dinosaur and take pictures from it’s mouth. We were able to get a pretty good organic espresso at a downtown cafe, but the lunch we had at Sizzling House was merely mediocre. 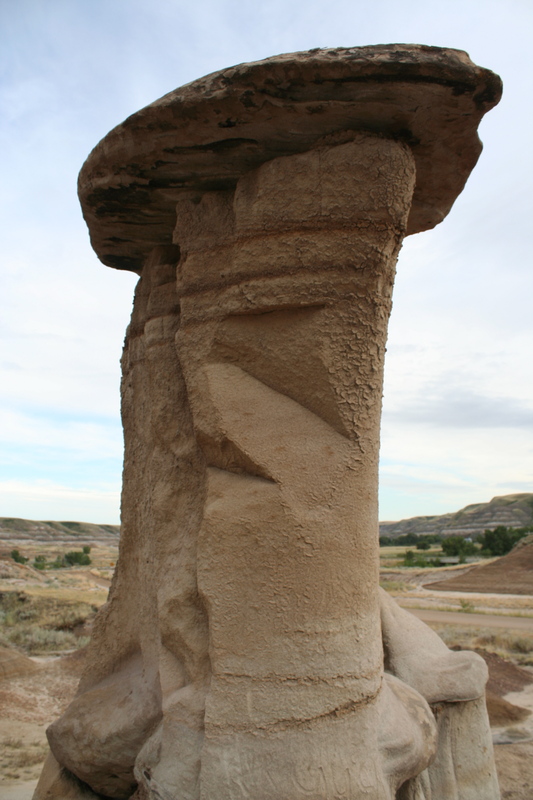 Hoodoos are hard rock formations that have sort of flat mushroom heads that stop the rock below them from eroding entirely. They take millions of years to form. All visitors guides to the Badlands show pictures of their majestic, towering hoodoos, often with the sun setting behind them. We needed to go. Drumheller gives out all kinds of free tourist maps, and we saw the hoodoos were only 16 kilometres away. It was fun to drive through the Badlands. I looked for tumbleweeds and we stopped at a lone butcher called Riverside Packers—-ha! Sounds like a sports team— and bought steaks (in case you don’t know, Alberta beef is famous for it’s fine quality). There were a lot of people there, and when we arrived we laughed and laughed. 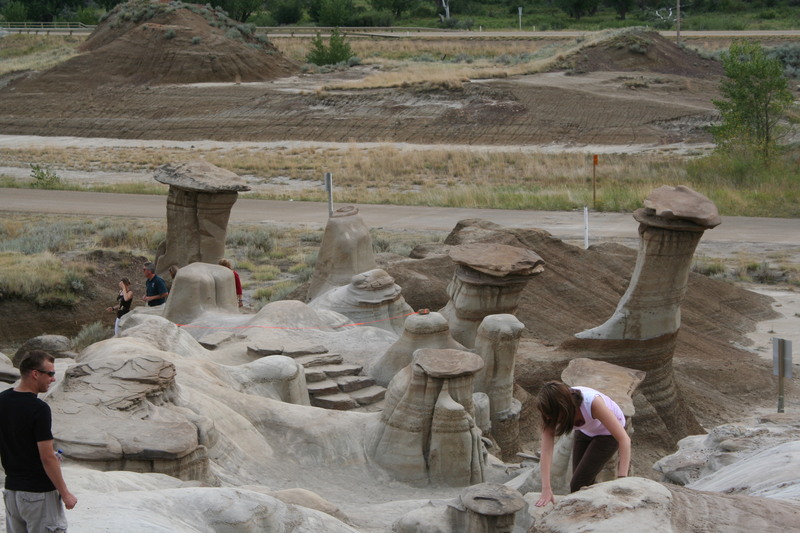 We had expected these sky scraping rock formations, but the hoodoos were shorter than we were! For some reason, people are allowed to climb all over them and some people have even scratched their initials in. It was hard to get pictures that weren’t full of tourists. You can climb high up the hill side, if you want to, but I didn’t. From the hoodoos we decided to check out the Last Chance Saloon. It’s in Wayne, but it’s a really short drive. To get there, you have to cross 11 (that’s eleven) one way bridges. In ye olde days, when miners hung out there, you could only get to the saloon by rail, but since then this bridge rich road was built. It’s an interesting place. 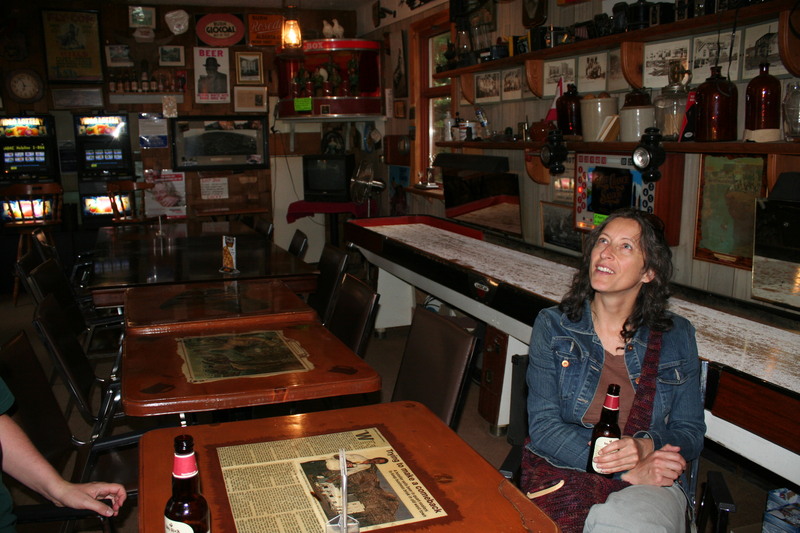 The saloon has a hotel, a second hand store, and a little campground. There’s still bullet holes in the wall of the saloon from some long-ago cowboy incident. A tour bus was just leaving when we got there, so inside the saloon there were only 3 other customers. We started talking to the other customers, and one of them told us he had been instrumental to bringing Expo 86 to Vancouver. He was proud of that and said he made a lot of money. Eventually I politely admitted I thought Expo 86 had really ruined everything nice about Vancouver (I have lived in Vancouver since 1984), and he said he thought so, too, which was why he moved. Thanks a lot, buddy. We liked it there so we decided to spend the night in the campground. The grounds were pleasant and grassy, with the badland hills all around, and sometimes there are music festivals there. The only thing that didn’t really work was the wood we bought at the second hand store was so dry it burned super fast, and the fire pit was so deep you couldn’t really see or feel the fire. After the first $10 bag was gone, we debated on buying another one, but just went to bed instead. 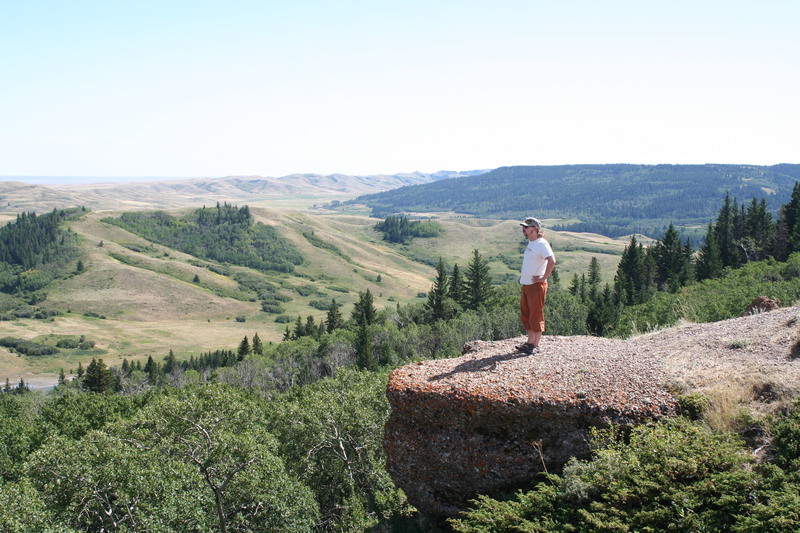 There’s a giant plateau straddling the border of Saskatchewan and Alberta, Cypress Hills InterProvincial Park, that has sides that are cliffs and if you stand on one you can see the rolling prairies go on forever. 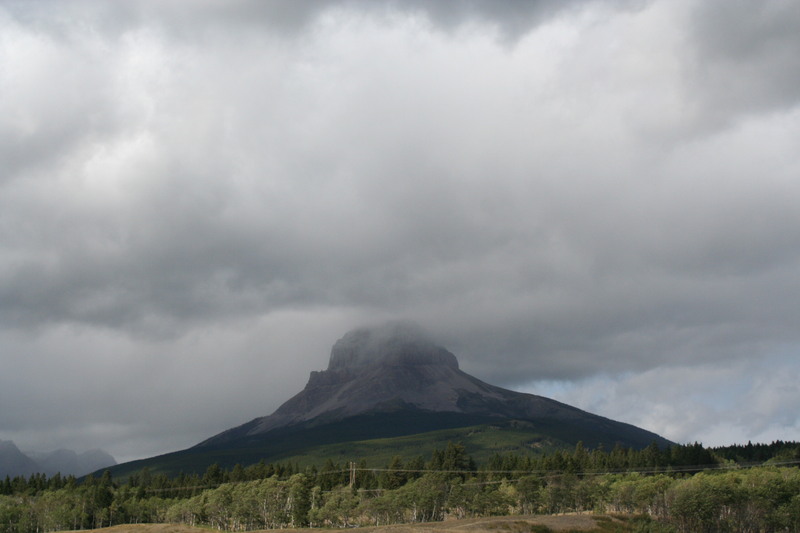 It is the highest point of Canada, in between the Rocky Mountains and Labrador. It was a bit of a drive to get there, but the ground got more hilly and instead of wheat fields we started seeing cattle ranches. When we got to the Hills itself, signs warned it was steep and the roads weren’t that wide so maybe you shouldn’t take your Mo-Hoe up there. We figured the Boogie Bus could handle it no problem and it did. 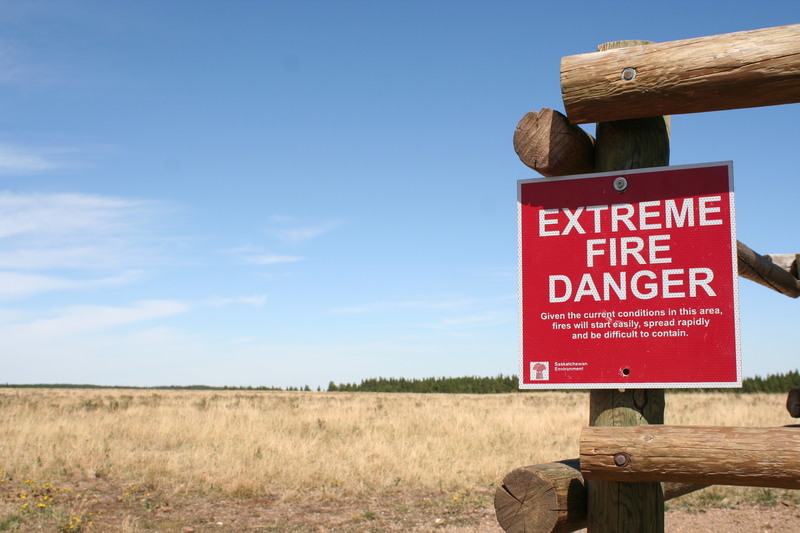 The top of the plateau was scorched dry and dusty, flat and covered with straw that was once grass. No one else was around and we stayed for about an hour, marvelling at the vie—we could see the curve of the Earth! We drove down the other side into Alberta. 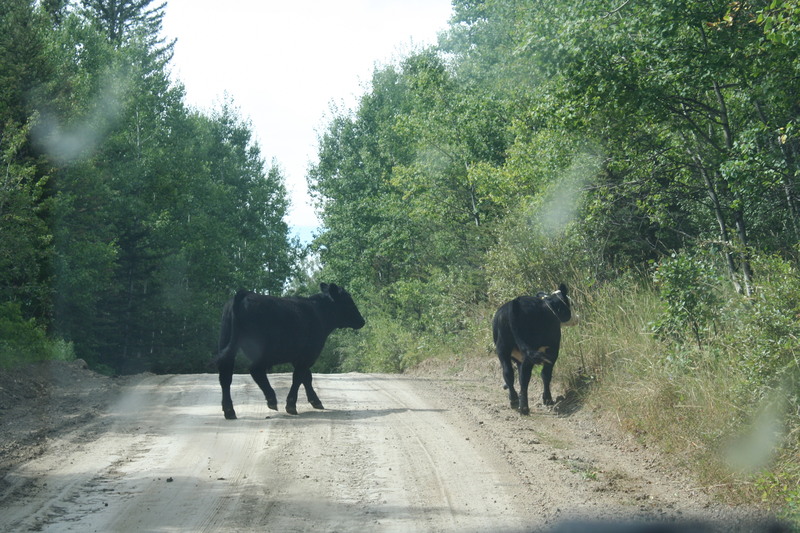 There are a all kinds of cattle ranchers there, and the cows can wander around the park at will, so we encountered a few “wild” cows. It must be nice to live in that park. 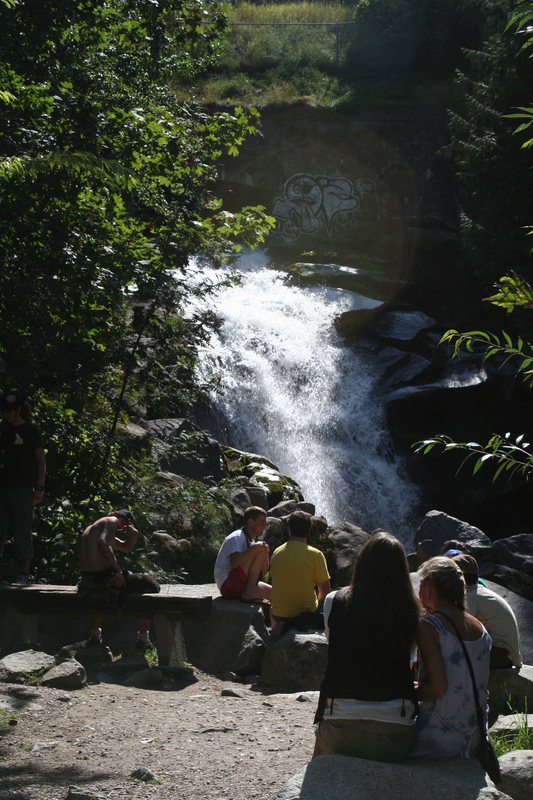 It feels kind of Western and once you get off the top of the hills it is forested and there are streams and such. Every now and then you see a house or a dude ranch. The roads are rustic. 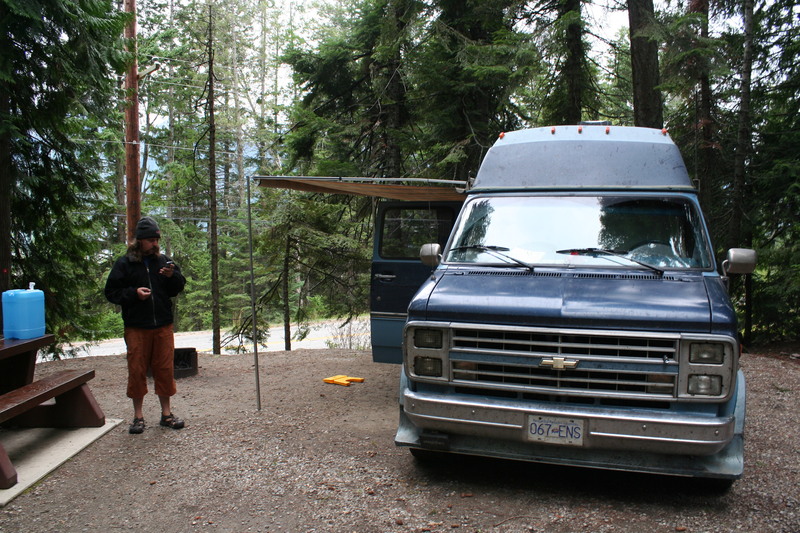 We broke one of the useless CB antennas—the Boogie Bus was really starting to look like it was getting around. 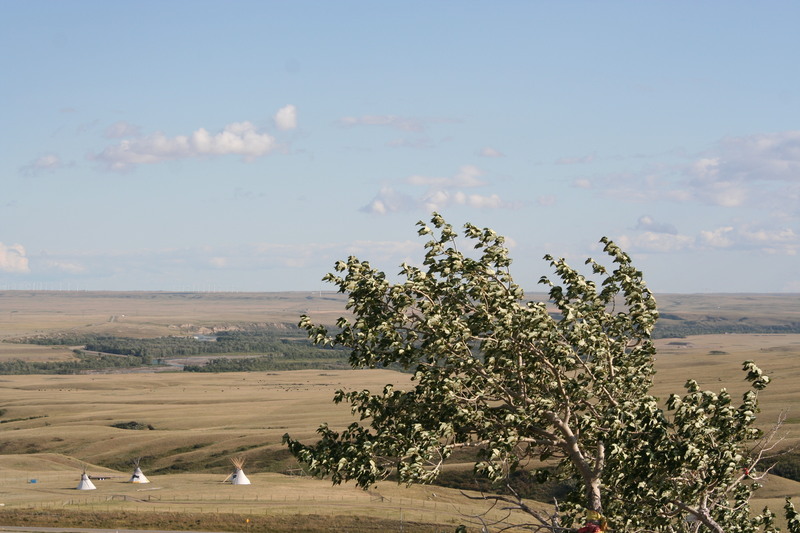 Medicine Hat, Alberta was the polar opposite of Moose Jaw. It was a place where it looked like people care, and it had art sculptures. We popped by the visitor centre and the person who greeted us was actually allowed to make dining recommendations, a gratifying circumstance that was new to us (although we had never stopped asking). They even had a complimentary RV sanitation station, where we filled up our water tank. But something went wrong and we flooded the van! On the up side, the floor got washed. We were worried because we would pick up Linda that night. Linda is a really clean person and at this point the bus, due to our sleeping in parking lots, not showering, and always being in a hurry, was a stinkin’ mess. We needed to clean it in the next 5 hours. We decided to try the Thai restaurant, and see if there was a laundry-mat nearby we could wash our clothes at the same time. 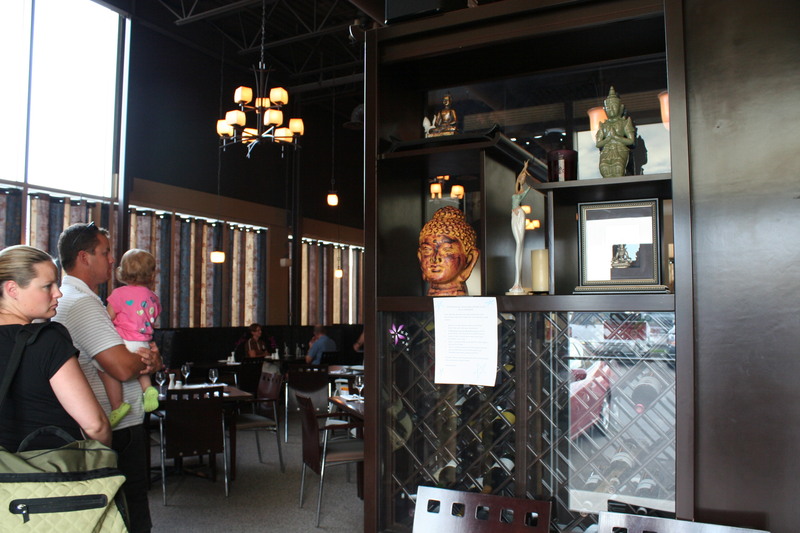 The laundy-mat was closed but the food at Thai Orchid Room was incredibly delicious. 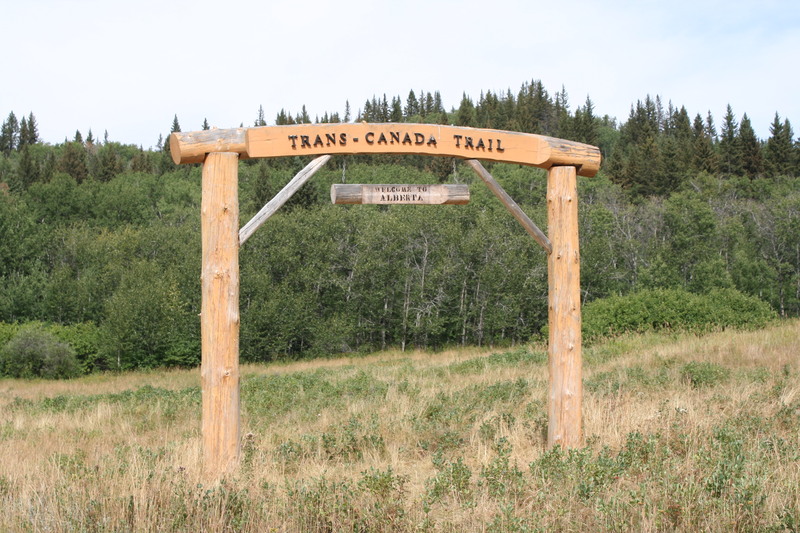 We booted it to the outskirts of Calgary and got a spot in a weirdly suburban RV park, oddly called Mountain View Camping even though there’s no mountain in sight, where we guessed a lot of the guests were living there and working in nearby industrial projects. They had a petting zoo. And a laundry room (with WiFi, thankfully). We pulled everything out of the van, did the dishes, wiped everything down, and then Step left me in the laundry room with my laptop and a giant stack of loonies, and went to pick up Linda at the airport. Even though we hadn’t driven this part of Highway 1 before, we noticed on the map the detour of Highway 13; the Red Coat Trail, was marked as a “scenic route” and since we were here to see Canada, we went that away. Unlike the Yellowhead highway (16), which is full of hills and water features, most of Highway 13 is what you imagine the prairies to look like—absolutely flat and full of golden seas of wheat. (You can watch your dog run away for hours, etc.) That is what makes it scenic. And it just goes on like that, with a little town and a grain silo every now and then, and sometimes those fire chimney things that burn off natural gas. It was beautiful and vast but there’s not much to note about it. 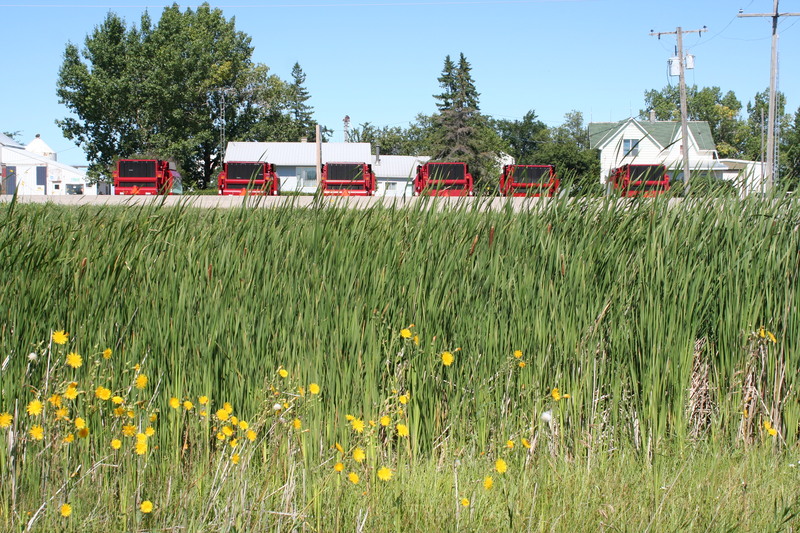 At Weyburn we stopped for gas, then veered north back towards Highway 1. 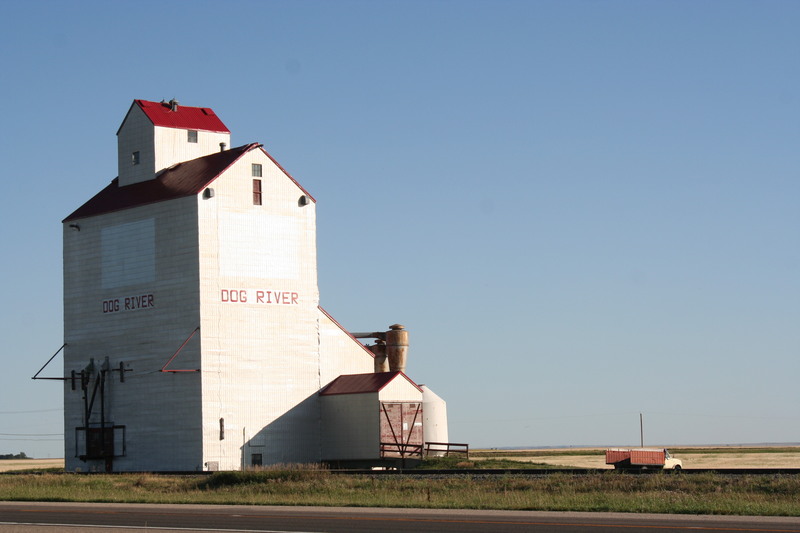 We were tooting along when Step noticed a grain silo that said “Dog River” on it. We don’t have cable, but I have watched some Corner Gas on DVD since I know (very slightly) some of the people on that show. 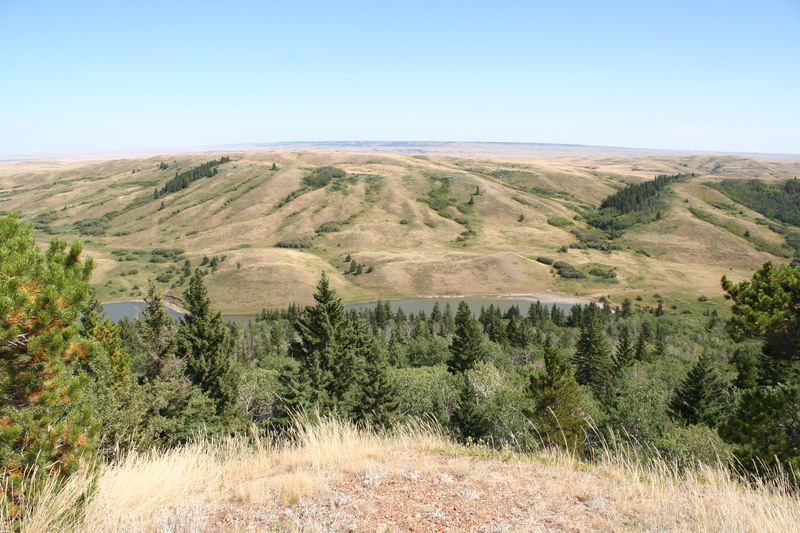 Step hadn’t seen it, but it was he that clued into the fact that Dog River was, in fact, a fictional place. 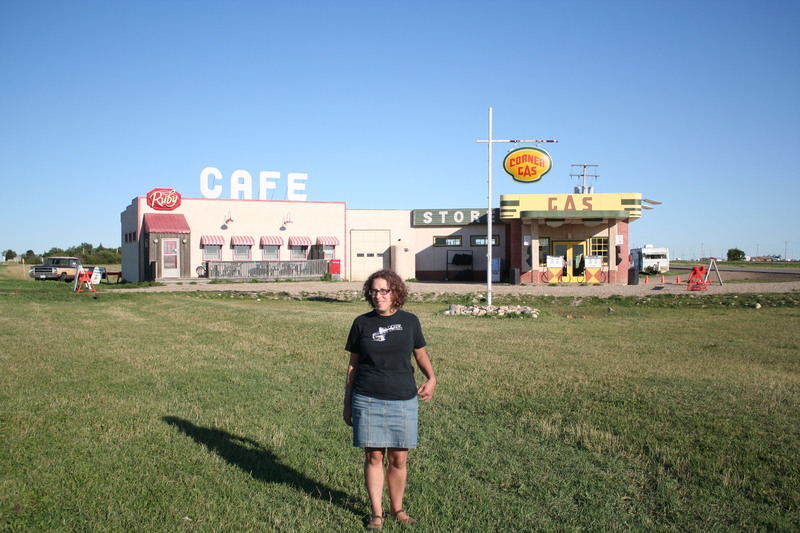 So we turned off and found the set to Corner Gas, which was a fun photo-op. There were a surprising amount of people there, doing the same things we were doing. The town is really called Rouleau, by the way. We didn’t go into the town so I don’t know if they have a traffic light or a charming cafe or what. 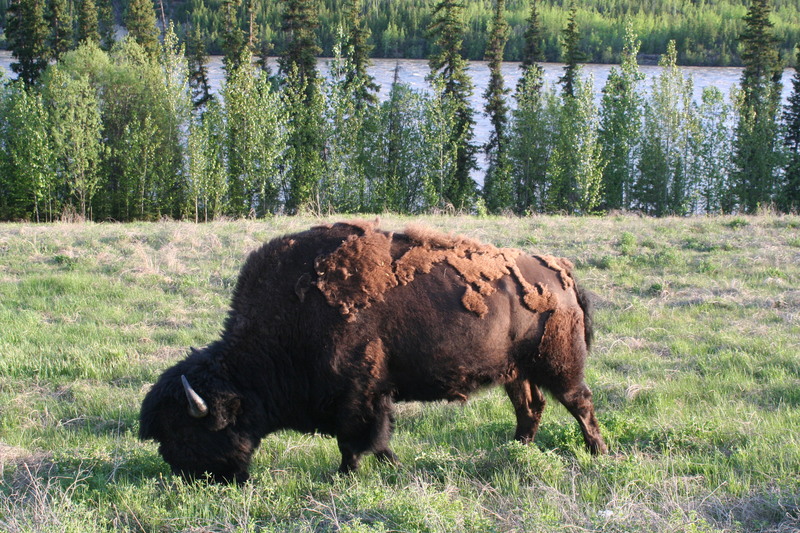 We were near Moose Jaw and we decided to stop for Dunch—that’s the meal between dinner and lunch. We drove all over the town of Moose Jaw and didn’t see one decent looking dunch spot candidate. There were some really divey looking places and the ubiquitous Chinese-Canadian eateries that are never good. I know I only spent a few hours there, and in fact did not even get out of the van downtown, but Moose Jaw really struck me as a dump of a town (sorry, Moose Jawians). There were a bunch of corporate chains near the highway. I wanted to go to Bonanza but Step prevailed and we went to (a weirdly crowded) Boston Pizza, where I ate a completely disgusting order of Lasagna, that about half way through I started worrying I was eating mad cow disease, so I did not enjoy it at all. 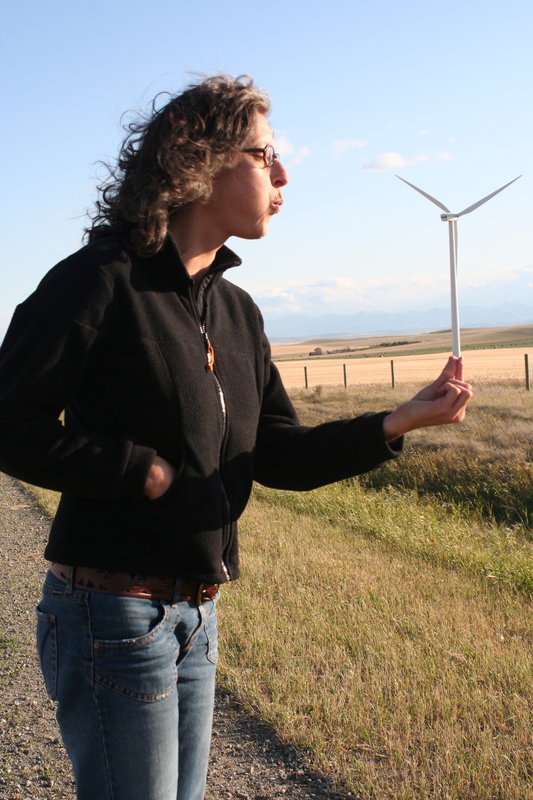 We got to Swift Current and we were too tired to drive on. We kind of looked at a $30 a night RV park, then said “what the heck” and stayed for a second night in the parking lot of the Wal-Mart.